how i can share a form whit another user? i have a form but i need to share the same form with other person without having to do it again. Hello you can add any JotForm user to become your sub-user. You can then adjust which forms for them to view or edit providing the permissions. 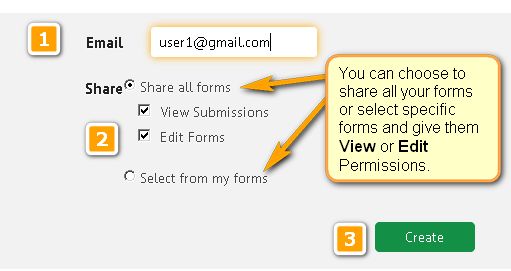 Go to your "Account" and Navigate to "Users" and click "Create New Sub User"
Afterwards, you can choose to Share all your forms or choose specific forms and assign permissions on selected forms whether View or Edit or Both Permissions.